AmericasLeading the world in qualitylift truck attachments, forks and accessories. In the materials handling industry, everyone operates on the same basic principles: move a product efficiently from Point A to Point B. But every business, large or small, is unique in how it pursues that goal and the obstacles it faces in doing so. In an industry that operates around the clock, even small barriers to productivity can cost a company significant time and money. One such materials handling company came to Cascade last year with the desire to push past those obstructions and take their productivity to the next level. Their particular needs demanded a high level of customization in order to reach their goals – and Cascade was up for the challenge. The customer in question was a large port that wanted to streamline their handling of paper rolls. Priorities included increased productivity, efficient roll handling, and an emphasis on damage reduction. In order to achieve these goals, the customer wanted updated, high-performance attachments and added driver feedback for intuitive handling. To really increase productivity, they had one very special request: to combine the capabilities of two different paper roll clamps into one attachment. If you’re at all familiar with paper rolls, you know that every type has its own handling needs – hence the wide range of Cascade Paper Roll clamps available. 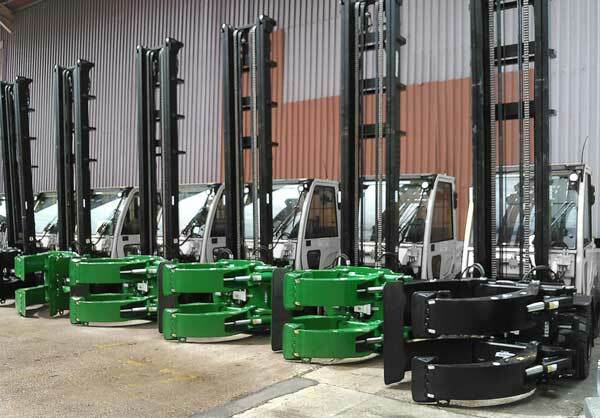 However, any facility that handles such a wide variety of rolls requires different attachment sizes and therefore multiple lift trucks. They then have to deal with the additional investment involved, in terms of both time and money. In order to avoid these disadvantages, Cascade’s customer needed a clamp that could handle two very different sizes of paper rolls. Enter the Cascade engineers. Cascade’s Engineering department boasts a global team, meaning a unique challenge such as this dual-clamp project can receive intensive, around-the-clock attention. What they came up with was a clever hydraulics feature that brings the capabilities of two paper roll clamps into one attachment. This innovative solution offers two distinct ranges of clamp force. The first stage applies the required amount of clamp force for handling heavy, large diameter paper rolls. The second stage applies a lower clamp force, allowing for ideal handling of more delicate paper types and smaller roll sizes. Integrated with Cascade’s popular damage reduction system, Hydraulic Force Control, it automatically applies the correct clamp force for any paper roll without driver input, removing guesswork from load handling and minimizing product damage. With this system installed, operation is fast and drivers are flexible in the sizes of paper rolls they can handle from a single truck. Beyond this central innovation that doubled the paper roll clamps’ utility, Cascade’s team also successfully delivered on the rest of the customer’s requests. Clamps were outfitted with indicator lights to inform drivers when the clamp arms were fully open or fully clamped. Operation was designed for maximum ease of use and high efficiency, including hydraulic optimization for fast-moving arms. The customer awarded Cascade their business after receiving the proposal, which involved a high degree of collaboration between Cascade’s Sales, Service and Engineering departments, as well as the lift truck supplier, paper producers, and end users. This was a particularly large project, and the global responsiveness from the teams was a crucial element to completing the project within a short time frame: three weeks. Cascade is proud of the resulting technologies, which will serve to improve future products for all our customers. This particular story is all about paper, but Cascade solutions touch every aspect of the materials handling industry, from forging and construction to appliances and warehousing. Cascade has a solution for every occasion, and our capacity to customize provides customers solutions that fit their unique needs. We look forward to more satisfied customers like the one in this story. If your business faces an obstacle that needs special attention, get in touch with us to explore the potential for a custom solution. Innovation is a core value at Cascade, but the best inspiration always come from our customers the field. ©2019 Cascade Corporation. All rights reserved.